Wolf needs to be unlocked. Up+B is great for recovery and good damage. It is also a great attack when used on the stage. Wolf takes time to get good at. When playing against a skilled Wolf character, he can be a dangerous foe. His slow speed is made up for with his strength as with all powerful characters. Like Mario, he is a well balanced character with medium speed and strong smash attack. All in all he is a great character and is for the people that go for the bigger, stronger, but slower characters. When using him you should rely on his smash attacks. Use them constantly, and throw out a bunch of lasers too. While he does not have a great recovery game, he is hard to KO. His real weakness is being very vulnerable after using Up+B. His Up+B is a good onstage move that you can direct at foes. If used while Wolf is at a high percentage, it is a suicide attempt. Claw Bite Slashes two times then bites. + + + + Stun Claw Slashes with both claws at once. This move has two hits, the first one will stun the opponent for a while and the second hit deals knockback. + + + + High Kick Wolf kicks upwards. This move has deceptive horizontal reach and can be a surprise KO move. + + + + Low Kick Wolf kicks while crouching. while dashing while dashing while dashing while dashing Dash Flip Does a flip kick at the end of his dash. Doesn't have as much horizontal range as you would think, only use it in a pinch. Smash + + + (Smash + ) or (Smash + ) or Claw Strike Lunges forward with his claws. This attack has a deceptively long reach, and has good knockback. It doesn't deal much damage. Smash + + + (Smash + ) or (Smash + ) or Scissor Kick A two-hit move, the first pulls the opponent in, and the second knocks them into the air. Smash + + + (Smash + ) or (Smash + ) or Double Claw Swipes claws low in front and behind. This is Wolf's best KOer as it comes out fast and ends fast, with lots of knockback too. after grab after grab after grab after grab Wolf Knee Hits his opponent with his knee. after grab after grab after grab after grab Forward Uppercut Uppercuts his opponent away from him. after grab after grab after grab after grab Rear Claw Claws his opponent away behind him. after grab after grab after grab after grab High Claw Claws his opponent upwards. after grab after grab after grab after grab Ground Claw Claws his opponent on the ground. This attack is deadly on the edge at high percentages as it sends the opponent on a powerful diagonal trajectory, putting them in a very bad position to recover or being not able to recover at all. Wolf Curl Curls into a ball and spins. Can hit an enemy multiple times, but does no knockback. + + + + Frontal Claw Slashes in front of him. Knock enemies forward and upward. + + + + Rear Kick Kicks behind him. + + + + Sky Slash Claws above him. + + + + Meteor Claw Slashes downwards. Opponents are instantly thrown downwards. Often referred to as "dair spike" (down air spike), this has great KO capabilities. Blaster Wolf pulls out his blaster and fires a medium-slow bullet that does significant stun. As he pulls his gun out it knocks enemies that are close to him. + + + + Wolf Flash He dashes diagonally upward to the side. If he hits an airborne enemy at the end of the dash, the enemy will get spiked. + + + + Fire Wolf He rushes in whichever direction you tilt the control stick. + + + + Reflector Similar to Fox's reflector; it can reflect enemy projectiles. Grants invincibility frames in the beginning. + He plants one paw on the ground and growls. Press it for only a split second when on Lylat Cruise to hear a radio conversation between the other members of Team Star Wolf (and sometimes, Team Star Fox). Landmaster: Wolf's final smash is almost exactly Fox or Falco's, the most notable difference being the color. Instead of blue highlights, Wolf's Landmaster has red colors. Wolf's Landmaster combines the strength of Fox and Falco's Landmaster. But as a trade-off, it's time on-screen is halved. It's heavier firepower and greater speed can KO nearly any character instantly, so use this to your advantage before you run out of time. Wolf requires time and patience to get good at. Wolf requires quick-thinking and advanced tactics to win with. When the match starts, it's a good idea to start off with multiple blaster shots. Wait until your enemy anticipates another blaster move and jumps over it, then punish them with Wolf Flash. Another good plan is to tap-jump and use dair-spike to put them on the floor. Use the forward and down smash often, but don't forget about your standard attacks, they have a surprisingly good offensive power. 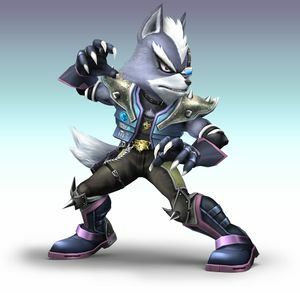 While Wolf Fire is his primary recovey move, Wolf Flash moves quicker and is hard to edge-guard against. Wolf himself is a moderate edge-guarder. His down and forward smashes execute quickly and have good knockback. Wolf's down throw launches enemies diagonally downward, so use it often on edges and they'll regret fighting Wolf. The trouble with Fox is he has most of the same powers as you. His superior speed and irritatingly rapid-fire attacks can land you with a bunch of damage before you even know what hit you. The upside is a player well-versed in Wolf won't be surprised by anything in Fox's arsenal. Avoid your special moves, as Fox is too fast to be hit easily. Instead, rely on Wolf's more basic and smash attacks, which have better reach than Fox's. Dodge around his charge attacks like Illusion and Fox Fire and strike him hard from behind. Another Fox duplicate. 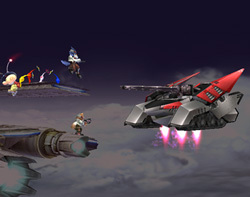 Falco's lower speed and higher jumps make him a better candidate for head-to-head combat against Wolf. Also, Wolf's up and forward specials have better range than Falco's so definitely rely on them during air combat. Wolf's angled Flash attack is actually useful here, as it takes advantage of Falco's slow, floaty descents and slaps that sucker back down to earth where your smash attacks will make quick work of him. However, it won't be so easy since Falco's chain grabs can quickly rack damage up on you. Lucario is a fair match up to Wolf, for they are both very powerful. One of the attacks you should be able to avoid is his B attack, where Lucario releases a blue ball of energy in the same way Samus releases one. You should use your reflection attack to send it flying back at him. They best strategy to use against Lucario is have him come to you, grab him, press down, and then full throttle with your B attacks, only using you smash attacks when he is close by you. Always try to let him come to you and then attack. Wolf is definitely at a disadvantage when it comes to speed, but you shouldn't have a problem if you use Wolf properly. One thing you must avoid at all times is abusing any of Wolf's B attacks due to a few laggy moves or you will be punished by Sonic's attacks. It's highly recommended that you focus on any of Wolf's ground attacks once you find a good opening on Sonic. Snake is a character with a lot of ranged attacks, which are hard to combat with Wolf. The way to combat this is to basically shoot him until he comes toward you, then use one of Wolf's special attacks to knock Snake down to size. Mr Game & Watch is easy. Just shoot him until he closes in, then dash attack him, jump and fair him. The only thing you should watch out for is his Judgment Hammer attack. If it hits and is a nine, it can one-hit-KO you. The gun is useless against game and watch. He can it, absorb it in the bucket, and punish you for thinking you can use that on him. His bucket has ridiculous knock back and can KO at extremely low percentage. So don't use the gun unless you are right next to him and he is stunned or just getting up. The key to beating him is to keep him on the ground as his smash attacks are relatively slow, but ridiculously powerful. Mr Game and Watch can aerial camp and get you to really high percentages and then get you with any smash attack and you are done. So keep him on the ground and go for the quick jabs and occasional side smash, but don't give him space to recover. In any aerial battle, he will always win. Remember to never use any kind of energy based range attack because he will absorb it in the bucket. Be quick, be smart, dont give him any room to hit smash attack, and use your charged up smash to kill him. He is the second lightest character in the game and if you are on a low ceiling map you can kill him at around 45%. ROB can be annnoying, as he has a great recovery and he has a reflector and two projectiles. Basically, as Wolf you will need to roll a lot and try to juggle ROB. This page was last edited on 24 July 2018, at 17:53.